mackerel on summer evening high tides which can produce strings of up to six fish per cast to lures, although the sea needs to be clear and calm. Lidar (also called LIDAR, LiDAR, and LADAR) is an acronym of Light Detection And Ranging (sometimes Light Imaging, Detection, And Ranging). 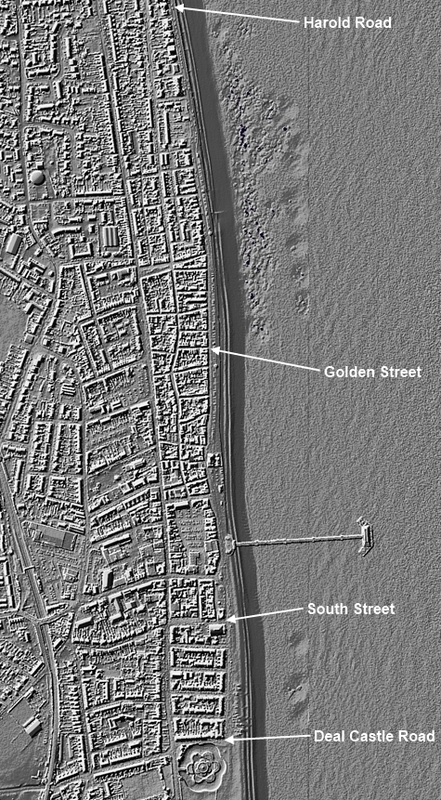 Lidar is a surveying method that measures distance to a target by illuminating that target with a laser light and is popularly used to make high-resolution maps. 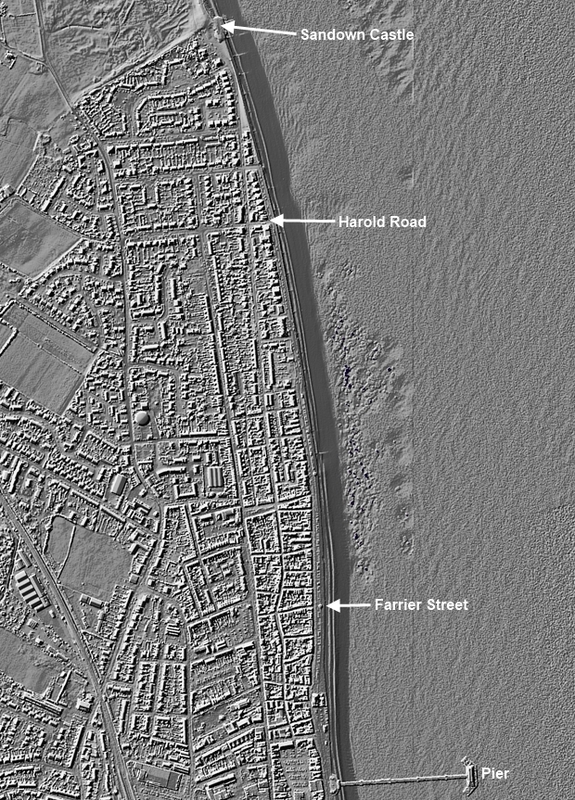 The following three Lidar maps show the seabed either side of Deal Pier from Sandown Castle (remains) in the north to Granville Road in the south. Fish may sometimes be caught from the beach by throwing out a line a considerable distance. 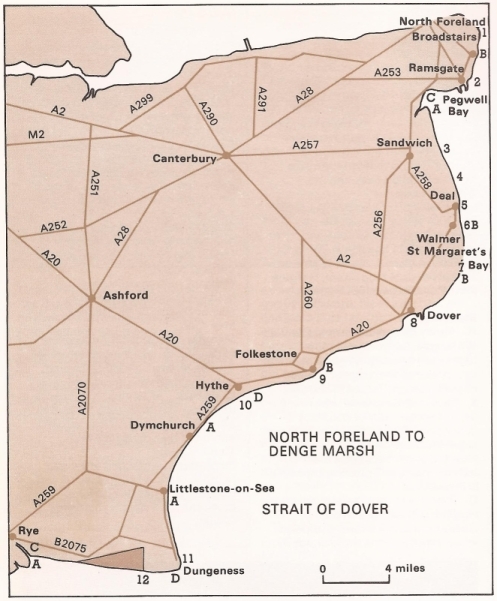 An ingenious plan adopted by fishermen at Deal and other places on the East coast, by which many fish are taken; it may hardly be termed angling, but merits a description. The tackle (see Fig. 42) - to begin at the far end of the line - starts with a button; then comes a short piece termed the sling line, then a lead, and, following that, the main line - with a few hooks, either on short snoodings or on the wire chopsticks described on page 57. An essential part of the apparatus is a springy, ash stick, about 3ft. long, tapered, and with a two-pronged fork at the end. The hooks being baited with squid, mackerel, or any bait sufficiently tough, the fisherman coils his line carefully on the shore, except the portion with the hooks, lead, and sling line; these he lays out in a line along the beach. He next places the button, which is at the extreme end of the line, in the fork at the end of the stick, swings the lead once or twice, and then casts it out as far as he can. The lead used weighs about 1½lb. The angler, with light tackle and dressed line, can throw out his sea leger or paternoster just as far as the Deal fishermen can their heavy leads. … Ground-baiting (see page 45), when it can be carried on, is very advisable, the best ground-bait being a mixture of pilchard refuse and pounded crabs … Where no pier is available, and the bottom is not too foul, the paternoster or leger can be thrown from the shore; but (excepting, of course, the mouths of rivers and quiet estuaries), owing to the wash of the waves, so heavy a lead is usually required to keep out the bait that the rod can rarely be used. At Deal, the tackle described in Chapter IV, page 54, is used for this purpose, and some very good takes of bass are made with it. Pieces of cuttle, squid, or strips of mackerel-skin, on account of their toughness, are good baits for use on tackle which has to be cast any great distance. Casting from the beach is often practised when it is too rough to go afloat. This is, perhaps, the best spot for angling on the south-east coast, as indeed one could guess, without going there, from the repeated advice in the Fishing Gazette from Mr. Sachs and others, to go there. Mr. Sachs is well known at Deal, and it is to him that I am indebted, not alone for the idea of originally trying Deal, but also for some very practical advice on Deal Pier a few summers ago. The best months are July and October - January; the former for pout and pollack, the latter for whiting and cod. There are but few places where the pier affords better fishing than boats, but Deal is certainly an example. The length of the pier, 1000ft., allows the angler to fish very deep water, and the strength of the "race" that sweeps round from St. Margaret's, brings many large fish under shelter on the north of the pier. The charges on the pier are 1d entrance, or 3d on and off all day, and each rod also pays a tax of 5d per diem. There is, in the season, a kind of depot at the end of it, where all the best baits can be had fresh every day. The pier master, Mr. Lawrence, was always a good friend to anglers, and often procured for me bait that was otherwise inaccessible. For angling purposes, I found the Antwerp Hotel (Mr. G. Ottaway) very comfortable, and as it is just at the entrance to the pier, much time is saved in getting backwards and forwards. The tackle shop is Frost's (ironmonger), in High Street. I have already mentioned his sea-paternoster. It is customary with the Deal amateurs to leave their rods in charge of the man at the turnstile for weeks, without taking them to pieces. This is surprising, considering what well-known amateurs visit Deal, and it is a piece of sheer laziness that I cannot recommend. The fish caught here in the summer are pollack, pout, and plaice. The best tackle is the paternoster or the leger. Heavy leads* are required, as the tide is strong. The best summer baits are ragworms or cockles, the former being sometimes rather hard to procure. The capture of lobsters on a hook is by no means uncommon, and in past fishing papers I find no less than seven cases. * Some of the Deal amateurs, headed, I believe, by Mr. Sachs, esteem a light lead a great advantage. 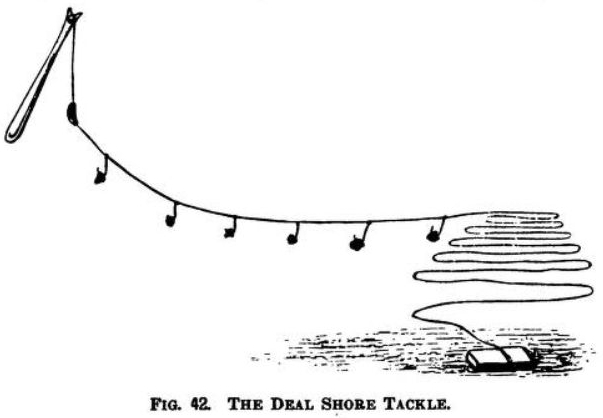 This requires some skill on the part of the fisherman to feel a tender bite, and distinguish it from the motion of the lead dragging the sand. In November there are plenty of cod and whiting, and the baits are fresh sprats or lugworm. The sprats (which cost about 1½d. for twenty-five) must be very fresh, and, to ensure this, they should be purchased direct from the smacks. The best part of the pier, as a rule, is either at the end facing Ramsgate, or else facing Walmer, about half-way along the stage; this, of course, depending on the direction of the tide at the time. Although the cod-fishing from Deal Pier is very good up to the middle of November and often later, yet towards the end of the year the best catches are invariably from boats, the fish generally retiring into deeper water before they disappear altogether. 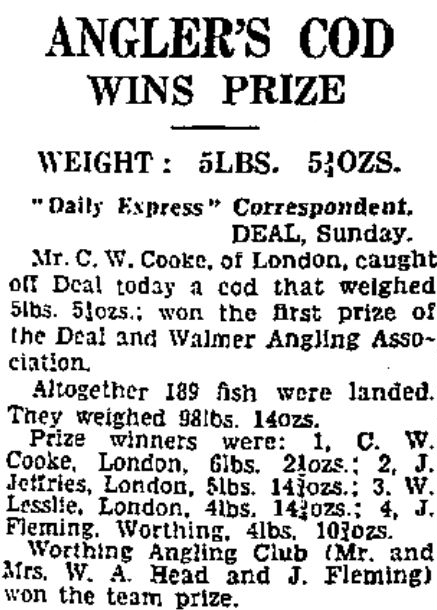 Deal Pier has some big scores in anglers' diaries; I was never very lucky there myself, but have seen some very fine fish landed, and have read of many more. In Fishing for January, 1889, there is mention of a single rod taking 100lb of fish, including a 16lb pollack. 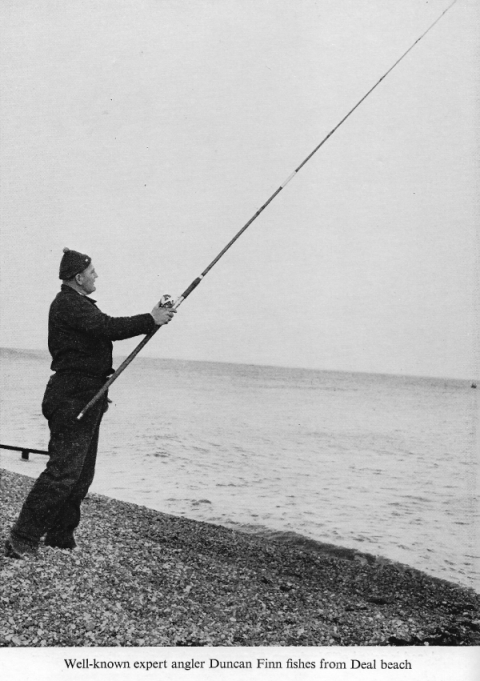 In 1884, a cod weighing 14lb was taken on a hand-line, and in 1885 Mr. Sachs' rod accounted for one weighing 11lb. This gentleman also mentions a lady having taken three lobsters (one of 3lb), and an angler catching a 3lb plaice. So much for Deal Pier. There is also some fishing to be had from boats. I recollect the position of a swim that in August, 1887, yielded a good many pout and flat fish. Unfortunately, though, I omitted to put the marks down in my diary - a piece of carelessness of which I am thoroughly ashamed. An idea of its approximate position, however, can be formed by a glance at Fig. 63. The boat's head was kept due east from the pier-head till about half as far out again as the length of the pier, and then turned straight for Ramsgate. The swim was about 200 yards from the pier-head. 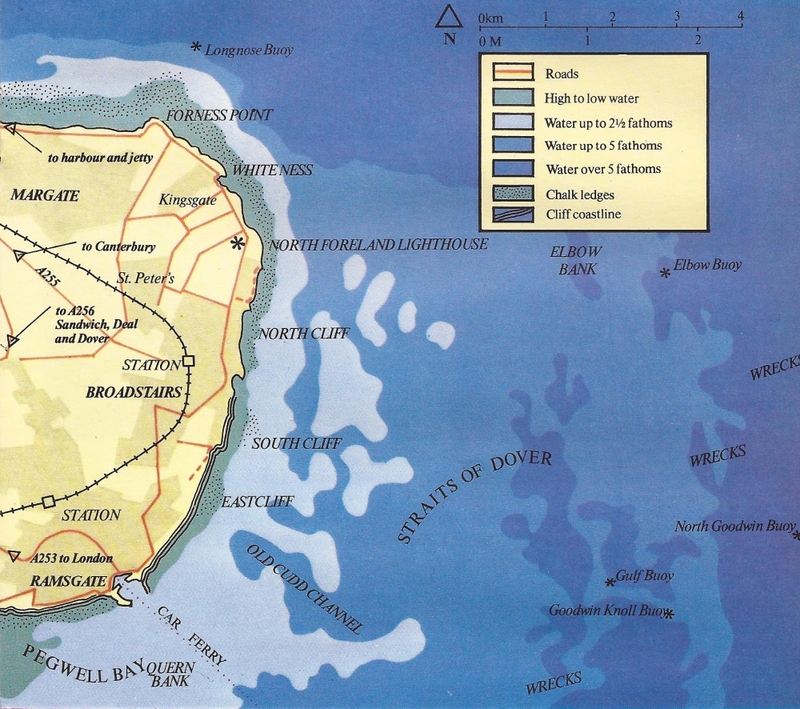 Boats also take parties out to the Goodwin Sands in smooth weather (charge 10s), where large numbers of pouting, as well as skate and other flat fish, are taken with lug and mussel. A favourite spot is Trinity Bay, where there is, at high water, nearly 60ft of water. At the back of the Goodwins is some very deep water, much frequented by French trawlers, which often knock up against our Ramsgate boats. In fact, Deal affords every kind of fishing. I have omitted to mention spinning from the pier for pollack with the piece of parchment (Fig. 48), as well as throw-out lines from shore, which is, I am told, not so good as formerly. Marsh is a good boatman. Deal is the happy hunting ground of the London sea fisher. I have counted eighteen of them, all fishing with rods from the steamboat stage at the end of the pier. The fishing from the pier in summer would be doubtless better if there were not so many steamers touching at the landing-stage. The fishing in the right season is distinctly good, more particularly for whiting; but the best sport is usually obtained during spring tides, and when the water is neither too thick from gales, nor too clear from absence of storms. A south-westerly gale, while it does not much affect the Deal coast, stirs up the Goodwin Sands and thickens the water to such an extent that fishing becomes almost impossible. A few pollack are caught from the pier in July, sometimes later; but the best of the fishing from that point of vantage is certainly in October and the early part of November. Herrings come to the place in great numbers in early autumn; they are followed by the sprats, and they in their turn are pursued by the cod, which devour them. Later on, when the cold weather begins, the fish seek deeper water. While whiting fishing from boats in the Downs, it is customary to lay out a drift trot for cod or codling. A feature of the pier fishing is a sort of bait depôt, at which one can buy lugworms, herrings, sprats, &c. The best bait to use from the pier for pollack are large ragworms. Codling, flat fish, and whiting prefer lugs, whiting also not being averse to pieces of herring. In addition to the codling and whiting, there are flat fish, conger, and whiting pout, and I have more than once heard of good-sized lobsters being caught on rod and line from the pier. But I must temper the charming picture with just a sprinkling of cold water: there are many blank days both from the pier and boats at Deal, but they should be few indeed if the angler chooses his time well and places himself in the hands of an experienced professional fisherman. During the autumn and winter there is no difficulty in finding the fishing grounds, for there are usually a score or more of boats to be seen out. The tide runs very strongly in the Downs, and off Deal the sea takes the form of a huge eddy. The tide flows northward towards Ramsgate, and ebbs southward towards Dover. When running fiercely, it is next to impossible to keep a lead on the bottom, and the tide has the peculiarity of continuing to flow towards Ramsgate for about three and a half hours after high water. During the period of spring tides fishing usually begins about ten or eleven o'clock, and if the tide is then running strongly, the first anchorage will be about a quarter of a mile from the shore. As the tide eases, the boat will be shifted further out, and the fishing can be continued until about four o'clock. Four or five hours is about the longest period for fishing during spring tides. If you ask a local man when he fishes he will tell you that he does so on "the ease of the flood and the draw of the ebb". When the ebb draws too strongly men up anchor, make sail, and head for the beach. When the water is clear, the best fishing is at night. From the pier there is fishing all day during neap tides, but for not more than six hours at a stretch during spring tides, unless a very heavy lead is used. The autumn and winter tariff at the Deal hotels is very moderate. For a sailing-boat and man a fair charge is about 6s a tide, or 8s a day. The largest whiting I have ever taken were from those same sea lochs, but it has been in the Downs between Deal and the Goodwins that I have found them most plentiful. There a hundred or more in the course of a few hours is no uncommon catch. The TOPE (Galeus vulgaris), another shark, variously known as white-hound, penny-dog, and blue hornless dog fish, is a very similar creature. In an old book, the "History of Harwich," by Dale, this fish is termed the Sweet William. Pennant imagines the name was conferred upon it ironically, its flesh being offensive and smelling rankly; but once, when fishing off Deal, the man with us described a spineless dogfish which I had just caught as a "Sweet William", and said it was very good eating. Possibly it was one of these topes I did not take much notice of the fish at the time. In appearance it resembled a small blue dogfish, but was without that sharp spine which inflicts such dangerous wounds. We caught some of the spined dogfish, also some nurse-dogs, as they are termed locally. These also are eaten at Deal, but the spined fish are considered worthless. A Local Government Board inquiry into the proposal of the Corporation of Deal to borrow £3,000 for the purpose of laying down groynes from Sandown Castle to the coastguard station with the object of protecting the Sandown seawall was held at the Town Hall on Wednesday by Mr. C. E . Meade King, the Inspector appointed by the Local Government Board. The Town Clerk (Mr. A. C. Brown) explained that the work was rendered imperative by the continual encroachment of the sea at that part of the town. There being no opposition the inquiry was over in a very short time. … at Deal, it is usual to try the sprat bait for cod when the water is clear, the lugworm when it is thick. The distinction is merely that between those baits that are found by sight and those others that are traced by scent. … the cod is for the most part a fish of deep water, though a number approach the coasts in winter, and are then angled for, especially at Deal. This fish is found more particularly, though not exclusively, in cold seas, and has the family beard, the young, or "codlings", being spotted. It is caught on our shores weighing 50lbs; but the amateur will not in all probability meet with any of more than half that weight. Though found indifferently on the sand or among the rocks, the edge of a reef is found to be the best ground for inshore cod. Cod … This large and important fish is caught from Deal pier between October and Christmas, when, unless the water is too thick, anglers are to be seen almost any fine day either at the end or half way along, their rods projecting from the upper deck. The favourite tackle is the paternoster, some local fishermen being in favour of a light lead only, which drags on the sand. I believe this is a method much used by Mr. Sachs, the veteran of Deal pier. Lug-worm or mussel are always good baits, but sprat or fresh herring will answer as well, indeed few fish are more catholic in their tastes. Cod show but little fight. There is a stately assertion of strength in any fish over 5lbs, but after this first move, the cod soon turns up the game, coming to the gaff like a lost anchor. Codling and silver whiting are also caught on the same tackle and baits and at the same season, but the hooks may be a size smaller. The cod, caught in some numbers on Deal and other piers, does not come in shore until the fall of the year … and the third week in October right on the end of the year will be found the best time. There is not much to be said in the way of special instructions for this cod-fishing, for, truth to tell, it is all a matter of the fish passing your boat; and I have more than once seen a new recruit catch the finest cod of the week on his first outing, scarcely knowing what bait was on his hook. This does not, however, detract much from the undoubted enjoyment of a day off Deal on a fine crisp November morning, when fish of twelve or fifteen pounds are taking the sprat or lugworm freely. The smaller cod, or codlings, are caught inshore throughout the year, especially in May and June, and one of the best spots for them that I can call to mind is, or was, the parti-coloured buoy outside Ramsgate harbour. Pouting-fishing is at once the most and least difficult of all inshore sport. The capture of small pouting, creatures going six or eight to the pound, and gorging without demur baits the size of their own head, is child's play, and needs no discrimination in the matter of tackle and baits, and very little skill in hooking the fish. When, however, the fish run about three quarters of a pound, a fair proportion indeed topping the pound - such as one may fall in with any fine September day in the Downs - it is no longer a case of All Fools' Day, but the prizes fall to the best tackle and the most skilful fisher. There is the modest pursuit of small whiting in a few feet of water … and there is the heavier, more enjoyable work out in the offing, where the water is over 100 feet deep, the leads a couple of pounds in weight, the tide running like a mill-race while the fish, averaging a couple of pounds or more, come up two at a time. That is fishing indeed, and is to be enjoyed throughout July and August on the south-west coast, or somewhat later in the year, say October, further up the Channel, off Deal and Ramsgate … Lugworm, sprat, herring or mussel, these are the baits commonly used on the Kentish coast, and I have had extraordinary luck with squid, only it is not always to be had in the autumn, when one gets the whiting-fishing so near shore. Deal With its autumn cod and whiting, this place has, particularly since the arrival of the B.S.A.S. on the scene, achieved considerable notoriety among London, and even provincial, sea-anglers. Though knowing it well, I have preferred to get these notes from one who visits the place regularly, and Mr. G. Read Clarke, of the B.S.A.S., has kindly come to the rescue. Besides the cod and whiting-fishing aforementioned, there is, he says, an earlier season (roughly May to September) for pollack and ground-fish. There is fishing, of a sort, from the pier throughout the season, and in the autumn some really good cod and whiting are taken here. For boat-fishing, the grounds are many, particularly in the form of wrecks, terribly common on this coast, and small patches of rock. Thus, there is a wreck off Walmer Castle, to find which it is necessary to get the flag-staff alongside the Walmer lifeboat house in line with the land side of the steeple on the house, and the windmill just clear of the Walmer Castle woods. Another wreck off Sandown Castle, an excellent pout-ground, is found by getting the land end of the pier-pavilion in line with the edge of Deal Castle and the first chimney (counting from the centre to the Margate side) of the coastguard-station on the flag-staff in front of the station. The grounds for flat-fish are not so many, but up to about a couple of years ago very large plaice were caught on a mussel-bank which had formed in line with the pier, some two hundred yards from the shore. There swooped down, however, a couple of Folkestone trawlers, who not only caught all the fish, but also destroyed the bank. Consolation was, however, derived from the knowledge that the raid cost them their nets! Another bank is now forming on the south side of the pier, from which, in the course of a season or two, good sport should be obtained. The baits for Deal fishing are lugworm, sprat, herring and mackerel; and pollack are also taken on the pier on ragworm, which has to be got from Dover. The fishermen charge about 6s per day for their services, and know all the best grounds. It is noticeable at Deal, more perhaps than elsewhere, that the rod has all but superseded the hand-line in sea fishing. Deal (Kent) - Fishing: Very good. Fish: Cod, codling, dab, horse mackerel, plaice, pollack, pout, whiting, etc. Best Months: July, October to January. Nor are visitors this August likely to be disappointed; for among the fish which may be taken are mackerel and there is no more delightful sport than mackerel spinning from a boat, bass (from the Kingsdown Rocks), cod (which are already "coming in", and afford one of the finest specimen fish caught on the coast), conger (out by the Bank Buoy), eels, dabs, flounders (towards Pegwell Bay), herrings, skate (10 to 16 pounders), whiting and whiting, cole or pout, generally in great numbers, with an occasional sole, a fine turbot, pollack, and plaice, to say nothing of crabs and lobsters, which, although they play havoc with one's bait, nevertheless afford compensations when caught. Nor need the sport prove an expensive one. A half-guinea rod, a sea-winch, a hundred yards or so of good stout line, with a few odd leads from 4 ozs. to lO ozs., and, roughly, the equipment is complete. Fifteen or twenty years ago one of the most famous stations for the autumn cod fishing on the English coast, at any rate within easy reach of London, was Deal, but in more recent times there has been an appreciable falling off there. Various theories have been advanced to account for this, but although the deterioration in the fishing is incontestable, the cause cannot be stated with certainty. One drawback to the Deal fishing is that tides run strongly there, and another is that one has to go afloat from an open beach. The Deal boatmen are probably the finest men for that particular work in the world, but the writer confesses to a decided preference for going afloat from a harbour. It may be perhaps advancing years … but whatever the cause he has come to look upon the absence of a harbour as a very considerable drawback to any sea fishing station. It does not add to the enjoyment of a day's sea angling to start the day with an appreciable quantity of salt water down one's neck … while most sea anglers who know their Deal have more than once seen a galley punt on landing half filled with water before the luckless angler could manage to hop ashore - which is a distinctly uncomfortable way of finishing up the day afloat! The writer does not know the record rod and line weight for the fish, but the largest whiting which he has actually seen landed by an angler weighed exactly 4lb and was taken at Deal about 18 years ago. It is well known that as a rule whiting prefer a sandy to a rocky bottom, although they may sometimes be taken on fairly rough ground. They swim in great shoals, usually a foot or two off the bottom, and when the fish have been located and are to be on the feed the fun, such as it is, is usually of the "fast and furious" order, and they may be caught with the greatest ease two and three at a time. Takes of from five to twenty score of fish per boat are not uncommon, but the heaviest catch the writer has ever heard of was made at Deal on October 22, 1919, when two anglers between them landed the extraordinary number of forty five score of fish, the great bulk of which were whiting. Some years ago (a turbot) of about 10lb or 12lb was caught by an angler … who was fishing in the B.S.A.S. Boat Competition at Deal. 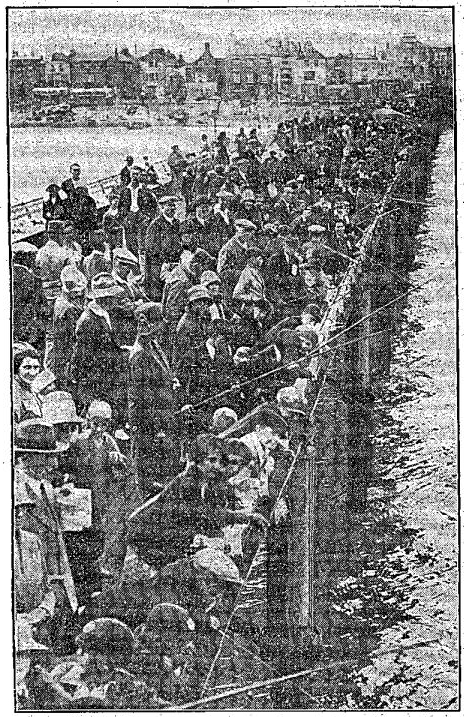 Deal has been very closely associated with sea angling for at least a quarter of a century, or longer; and the autumn competitions of the British Sea Anglers' Society, which were commenced soon after the Society was founded, were held there regularly every year down to the outbreak of the war. The fishing is not now so good as it used to be twenty years ago, but the autumn fishing for whiting and cod was excellent; and at one time there were a good many pollack around or under Deal pier. One drawback to the boat fishing at Deal is that the tides run strongly there, and another is that one has to go afloat from an open beach; but there are good boats there in plenty, and the Deal boatmen have a deservedly great reputation for their capability, and some of them (latterly) for their charges! There are one or two old wrecks off Deal which often hold good conger, but not all the men know the marks of these; and in the summer there are generally a good many tope near the Goodwins, although tides run so strongly out there that comfortable rod fishing is out of the question except during slack water, so that the game is hardly worth the candle. Some very good bass have been taken pretty close to the beach at both Deal and Walmer, in some cases by anglers fishing from the shore. At one time Deal was a well-known place for winter cod, but to-day it is no better than any other town on the Kent coast and does not compete with places north of the Thames estuary. Bass: Soleskin lures, kipper, peeler crab. Bass are not numerous, but good fish are occasionally taken in the breakers, and from rocky ground three miles south of Deal. School bass are caught in the mouth of the River Stour, four miles north. Black Bream: Black bream appeared in the waters off Deal in the summer months of 1950 and 1951, where they provided good sport for anglers using lugworm bait. Cod and Codling: Winter, spring and autumn. Lugworm, sprat, peeler crab. Anywhere on rocky ground between Sandown Castle and Kingsdown. Conger: June to September. Fresh brit and small herring, pouting etc. All inshore wrecks, which are numerous. Dabs: September to February. Lugworm. Sandy ground to north of Deal from inshore to No 1 Buoy. Dogfish: All the dogfish family are numerous, including the lesser spotted, the spurdog and the bull huss. The lesser spotted dogfish is caught off most marks, but the other two species remain in deep water between the Bank Buoy and the Goodwin Sands. Bait: lugworm or small fish. Flounders: September to February. Lug and peeler crab. All inshore fishing marks. Mullet: Grey mullet visit the mouth of the Stour, and red mullet are found by wrecks, but neither species is much fished for. Plaice: June to September. Lugworm. Numerous in Sandwich Bay area. Not common off Deal. Pollack: June to September. Feathered hook or baited spinner. One mark only, the wreck of the American transport James Harrod, ¼ mile off Deal Castle. Pouting: All the year round. Almost any bait. Numerous everywhere from inshore to the Goodwin Sands. Skates and Rays: May to September, though a few are caught in mild winters. Mackerel, herring, peeler crab and lugworm. Found on most marks to the north and east of Deal out to the Goodwin Sands. Not so numerous to the south. Tope: April to September. Mackerel, whiting, dabs, pouting. Inside edge of Goodwin Sands. Occasionally inshore to the north and east of Deal. Whiting: September to December, and in some years remaining until March. Lugworm. All marks, but northern ones usually better. Note: The lugworms mentioned as bait are a species or variety found only in the vicinity of Deal. They are thicker and longer than the normal lugworm, and are known as Deal Yellowtails. (Deal and Walmer Angling Association). Deal: Good general fishing here all the year round, noted for the autumn and winter run of cod and codling. On the south Kent coast Deal is an excellent centre for fishing from the shore, a great variety of fish from flounders to skate being taken from the pier and beach. Like all the south coast resorts, this offers tope fishing from boats, and many of these fighting fish are taken every year. Many of the piers on the south coast provide good fishing for grey mullet when they are in which is likely to be between July and early October, but the shoals come and go without any strict time-table. Mullet fishing is a specialized art, but if you are visiting in this period it is worth packing your coarse-fishing rod and tackle in case you get a chance. The stretch of the English Channel which borders Deal offers a large variety of fish, making an ideal spot for the keenest fisherman or the veriest amateur. Proof of this is the evidence that one lady angler caught 365lb of fish in one day. The beach-angler can fish all the year round. During the winter months the locals fish to the north of Deal where there is an eight-mile stretch of sand . Dabs, flounders, whiting and skate are generally to be found. In spring to autumn the fishing is more central, on another five-mile stretch of shingle beach, with patches of rock . From here codling, dogfish, pouting, flatfish and a few bass are landed. Boat-fishing, when conditions are favourable, can be followed in all months. Late spring brings in the skate in large numbers. Also the tope are on the move and these fighting fish can be caught into late summer. Very deep water is to be found within a quarter of a mile from the shore. During the tope season, which is mostly on the Goodwin Sands four miles from Deal, large bags of mixed fish can be caught by those who prefer general fishing to tope work. Mackerel can be had on feathered lures, also skate, dogfish, dabs, whiting and conger. In summer months good sport is had with bream, pouting and flats quite near to the shore. Autumn brings in the codling and whiting shoals, skate, dogfish, herring and sprats. Conger enthusiasts will find plenty around the numerous wrecks that surround the area, but it is best to have the services of a local boatman. Boats, rowing or motor, can be hired. Deal, Kent. Numerous specimen fish are landed here and it is regarded as one of the most productive parts of the south-east coast. The quarter-of-a-mile long pier which was opened by the Duke of Edinburgh in 1957 is quite an amenity. Both medium and light tackle is used by pier anglers for the many summer species. During winter, shore-based anglers prefer to cast from the beach to the north of Deal. Most 'bags' are usually codling, whiting, dabs and flounders. From April to autumn more anglers use the central shore of shingle and rock patches. Bass are taken, as well as pouting, codling, flounders, dabs and plaice. Bunched lugworm is a useful bait for most of the fish, and a long flowing trace which moves around in the surf is favoured. Herring or mackerel can sometimes produce favourable results. Boat anglers are fortunate in having a long season which runs for about eight months of the year. In Spring numbers of skate start to move in and large 'bags' of thornbacks are made near the Goodwins, about four miles from Deal. They take various baits, often lugworm is very successful, fished straight down from an anchored boat using one-hook leger gear. Plenty of specimen tope from 30lb to 40lb are boated during the season. They start running in June and, according to the weather, remain until late summer. Large mackerel catches are made and other fish around the Goodwin Sands include conger, dogfish, dabs and whiting. There are several other inshore boat marks where summer fishing provides sport with bream, pouting and flats. Large conger keep around the sunken wrecks of the area, but a local experienced boatman is necessary for the marks. Care is needed not to snag tackle. All the usual Channel species of fish can be caught from boats and from the pier, which gives access to deep water. Angling is strongly encouraged here, and boatmen, tackle dealers, bait merchants, the Corporation itself and, perhaps even more important, the two angling clubs set out to help them. The following is a list of fish commonly caught on rod and line along the Kent coast, with details of the periods during which they are most likely to be encountered. It must be stressed, however, that these periods should only be regarded as a rough guide. Fish are influenced by water temperature, food supply, and various other factors, and their movements usually vary slightly from year to year. Bass. Mid-spring to late autumn, but September and early October are often regarded as the best months for the large ones. Black Bream. The period varies slightly from place to place, but bream can be expected over deep sea marks from about May to late July - the peak period for large specimens being late May and June. The fish arrive somewhat later inshore. Cod. The bulk of these fish are caught in late autumn and winter, but in certain areas a few may be taken as early as September. Catches vary considerably from year to year. Conger. May be taken all year round by deep sea boats, and also by inshore anglers in a mild winter. Normally, however, big conger are most likely to be caught inshore from late spring to late autumn. Dogfish. The various species of dogfish may be taken all the year round, when food is available. Spur-dogfish are most likely to be encountered inshore during summer and winter, but may also come in after the winter sprat and whiting shoals. Flatfish. The various species of flatfish can be expected during most of the year, when weather conditions are suitable. On the open coast, especially near estuaries, flounders are usually most plentiful in winter, when they are gradually working seaward to their spawning grounds. After spawning in late winter or early spring they remain out of condition for a month or two. Later on, during summer, autumn and early winter, flounders are plentiful in suitable tidal rivers. Garfish. June to early September. These odd-looking beaked fish often arrive with the mackerel shoals. Grey Mullet. June to late September, with August often a good month. Mackerel. June to September, with July and August usually the best months. Pollack. Not usually very large at inshore Kent marks, but some quite large ones are taken when fishing over deep sea wrecks. The best period is late spring to mid-autumn. Pouting. All the year, but they tend to move out into deeper water during cold spells in winter. Skate. May be encountered by deep sea boats throughout the year, but most common inshore from late spring to early winter. September and October are often very good for thornback ray. Sting Ray. Usually come inshore during summer and early autumn, but they are rather localized. Tope. Mainly taken by inshore boats during summer and autumn, but they may turn up almost anytime - even in mid-winter when they are hunting whiting shoals. Whiting. Large silver whiting ("silvers") may be caught at suitable deep sea marks for much of the year, including the summer months, but anglers fishing from beach, pier or inshore boats are more likely to catch them in numbers during the autumn and winter." Good low-water area, especially in winter and after a summer blow for bass. Local yellow-tail lugworm, a variety of black lugworm, produces the most fish, though crab scores for spring cod and summer bass. A very long pier, ideal for angling, that produces plenty of fish when conditions are right. Mullet, bass, conger eels and cod are the most talked-about species there. Some nasty snags to either side among the rocks, so obtain advice first. Night fishing is restricted. The beaches to either side of the pier are quite steep, shingle going on to rocky ground with a few sand patches. The Deal charter fleet - some 50 boats to around 27ft - is kept to the south of the pier and launched straight off the shingle. There are several good tackle shops, one such, from which boats can be chartered, is Channel Angling, Deal Pier, Beach Street, Deal (Tel: 03045 3104). Species as for Deal. Plenty of car parking - and a pub - within a short walk of the beach. Deepish water close in produces the best results after dark. For charter boat bookings, bait and information contact The Downs Tackle Centre, 29 The Strand, Walmer (Tel: 03045 2811). Similar summer fishing to Ramsgate, with excellent winter cod fishing with fish to 20 lb. Good spots are the pier area of the beach, Sandwich Bay and Walmer, just to the south. Bass and flatfish will often stay into winter. Best baits are cod and squid, with sprats a favourite for whiting. Boats, tackle and bait available locally. Deal is always wet and windy; perhaps that's why it's such a good place for shore fishing. I live there and conditions are always ideal; overcast, pea soup sea and a stiff breeze. Its situation on the corner of Kent must be to blame for its weather and, unlike many of the other Kent towns, Deal lacks sheltering hills. It's bleak in winter with its steep shelving beaches offering little protection for the angler - even the wooden groynes are few and far between. But what it lacks in comfort it makes up for in cod and codling. The complete length of the shore between Sandown and Walmer, to the west, offers cod, especially in darkness over a peak ebb tide. Top bait is peeler crab, which has a certain magic compared to other baits in the region. It is so good that I will not fish Deal without it. Frozen peeler is as good as fresh in winter. Deal has its popular fishing marks, although they tend to be close to car parks or landmarks, and indeed the beach is excellent anywhere. My favourite mark is at Boundary Road, at the Walmer end of the seafront, near Kingsdown. Other marks include Sandown Castle, Walmer Castle and the Kingsdown Butts.